The EU will release a full report by December 15 on the preparations made by Ukraine towards obtaining a visa-free regime with the EU, Ukrainian Foreign Minister Pavlo Klimkin has said. "We have a clear agreement on December 15 as a final date, when the European Union will present a full report on what has been done by Ukraine," the minister said during an hour of questions to the government on Friday. 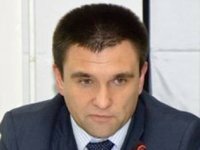 Klimkin said that Ukraine and the EU have an agreement on the expert missions which will assess Ukraine's progress towards obtaining the visa-free regime.